The constant battle between grandparents and social media wages on with absolutely no end in sight. If you think that the next war is going to be fought on a battlefield, you’re wrong. It’s going to be fought on our grandma and grandpa’s Facebook pages as they continue to struggle with how the platform works. With more and more older people flocking to the site in hopes of rekindling old friendships, there’s going to be more and more blunders. 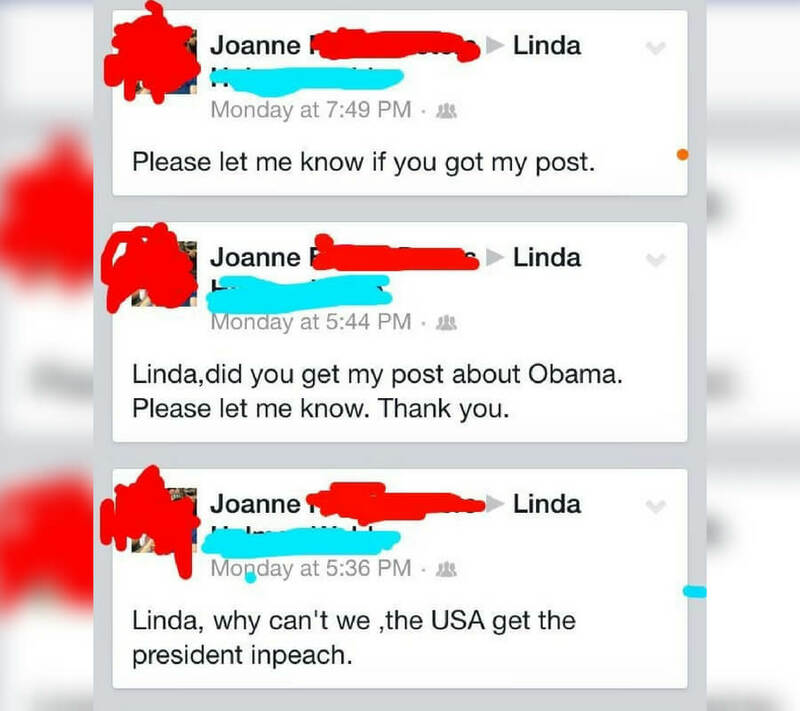 Thankfully, the internet caught on to this pattern and captured some of the best grandparents moments on Facebook, and it’s everything you can imagine. It’s hard enough to teach your grandparents how to post on their friend’s wall without any mishaps, so take what you can get. The autocorrect tagging system is something that gives a lot of old people some trouble, and this picture perfectly sums it up. This is a great opportunity to become friends with the Grandmaster himself. Many old people don’t fully understand what anything on the internet is and fly by the seat of their pants. 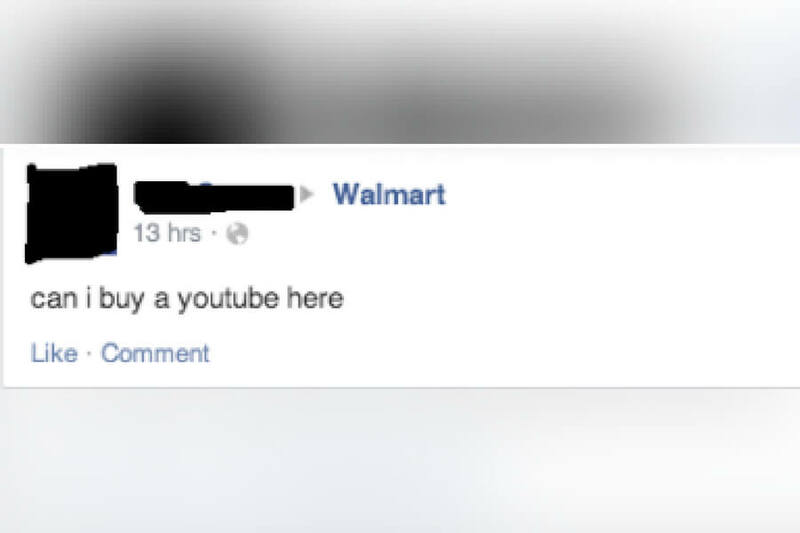 I mean, if you were going to buy a ‘youtube,’ Walmart would be a good starting point because they have everything you’ve ever dreamt of needing. Unfortunately, I just don’t think they’ll be able to help this person out. There’s nothing quite like a grandmother’s honesty. This post is SO relatable, and we all wish that we had the guts to do it. There are so many annoying people on Facebook that we wish we could delete without having to face any repercussions. In this case, the honesty seems to have paid off. 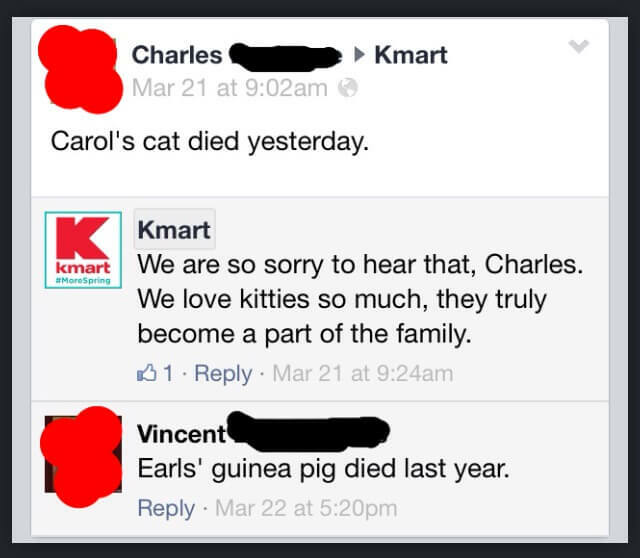 Coming up, a few grandparents take to the K-Mart Facebook page to give their condolences. If you haven’t rewarded yourself by searching “people of Walmart” on Google, you need to do that (after reading this article of course). There are some absolute characters that walk the aisles of the superstore. 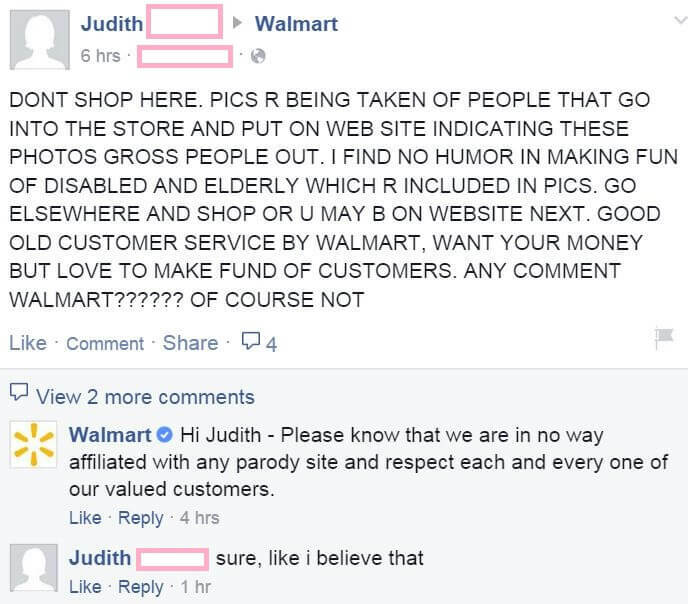 Judith thinks that Walmart is behind this popular website and you know what? She might be on to something. On any occasion and at any time, you can count on your grandparents to be insanely complimentary to you. 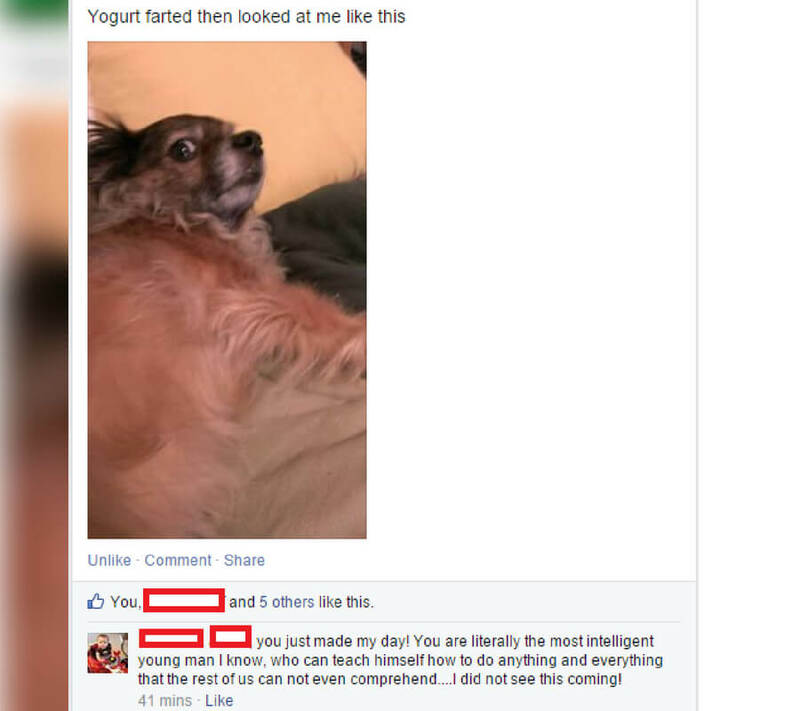 For example, this guy posted a picture of his dog Yogurt after he farted, but that didn’t stop his grandpa from telling him how impressed he is with his grandson’s intelligence. We all need a grandparent like this. Sometimes you need to get some of the things that make you emotional off your chest. It seems that Charles and Vincent saw Kmart’s Facebook page as their therapist and we’re all for it. I wasn’t aware that Kmart had this kind of reputation on the social media site, but I’m going to be visiting their page more now that I know. Just ahead, a grandfather makes sure that his grandson isn’t even thinking about being a crazy cat person. You know what? It doesn’t hurt to ask, even if it’s on Facebook. This grandpa doesn’t want to be THAT guy who isn’t invited but shows up anyway. 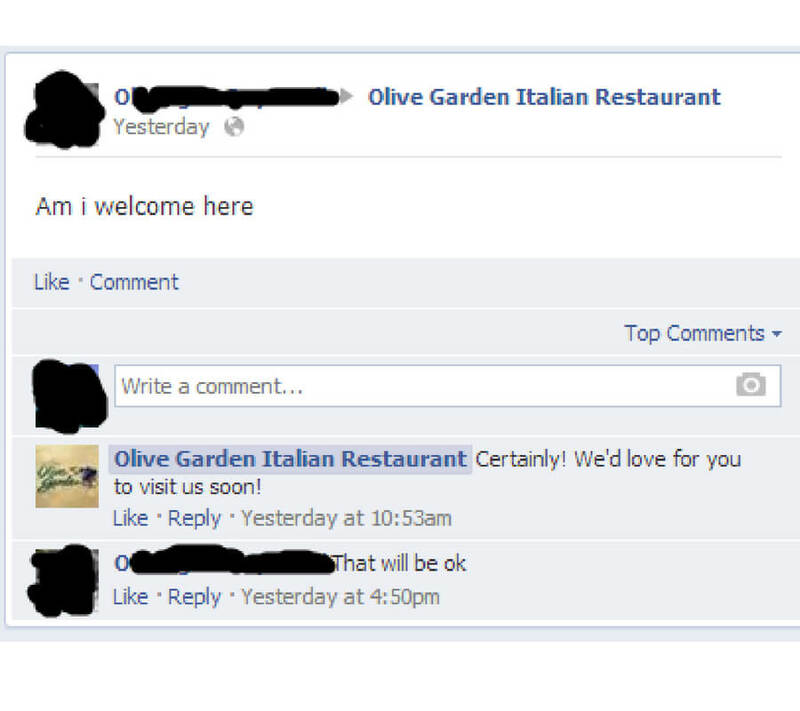 He went straight savage when Olive Garden extending him an invitation and he declined their invite. That’s a power move if I’ve ever seen one. I think that we all owe Susan a huge THANK YOU for her hot take about what to put and what not to put in the microwave. She points out two, uh, overlooked things that people sometimes, uh, put in the microwave. 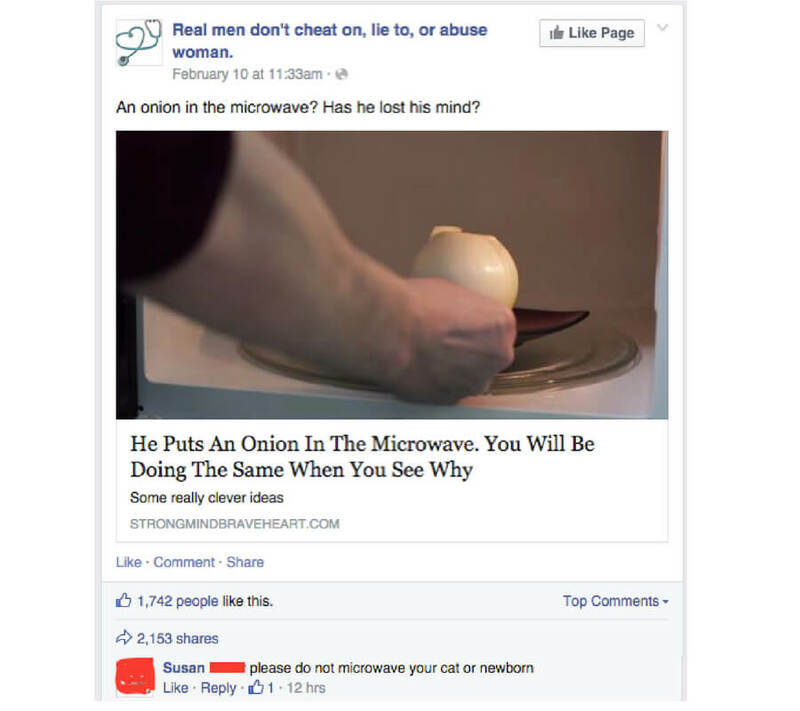 Please don’t put your newborn or a cat into a microwave. Nothing good comes from that. 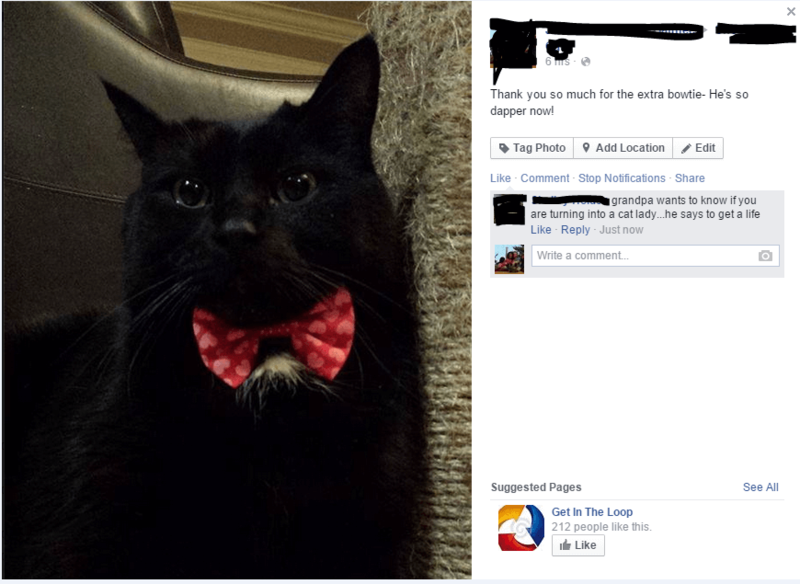 Okay, I’m very happy that this grandpa spotted that their grandson was turning into a cat person and called him out for it. Cats are evil and will eventually kill you. I’m not a doctor, and there aren’t many studies that prove what I said, but I think it’s basic science. 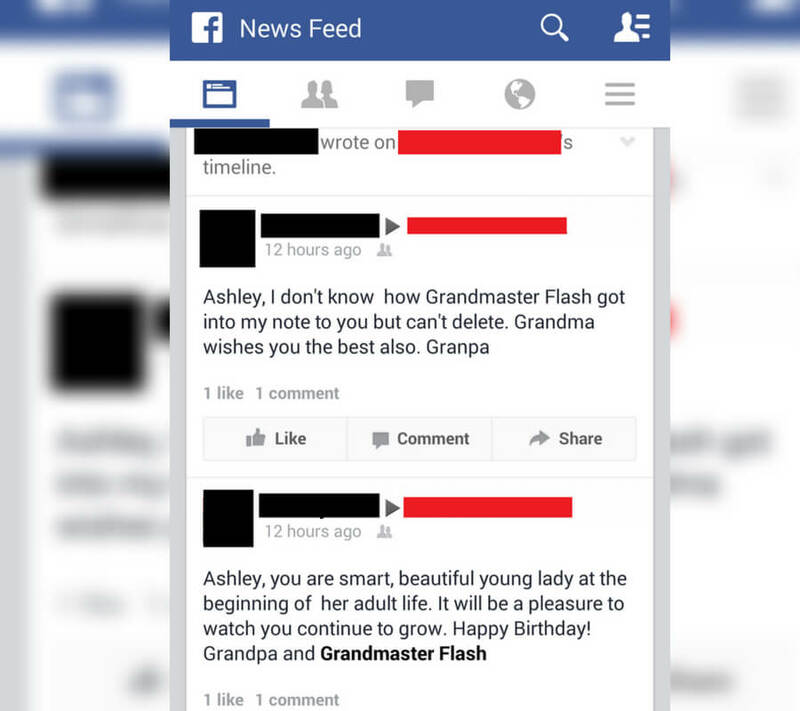 One grandpa takes to Best Buy’s Facebook page with some serious threats. That’s coming up. You know the whole wrong place, wrong time thing that can happen to you in real life? 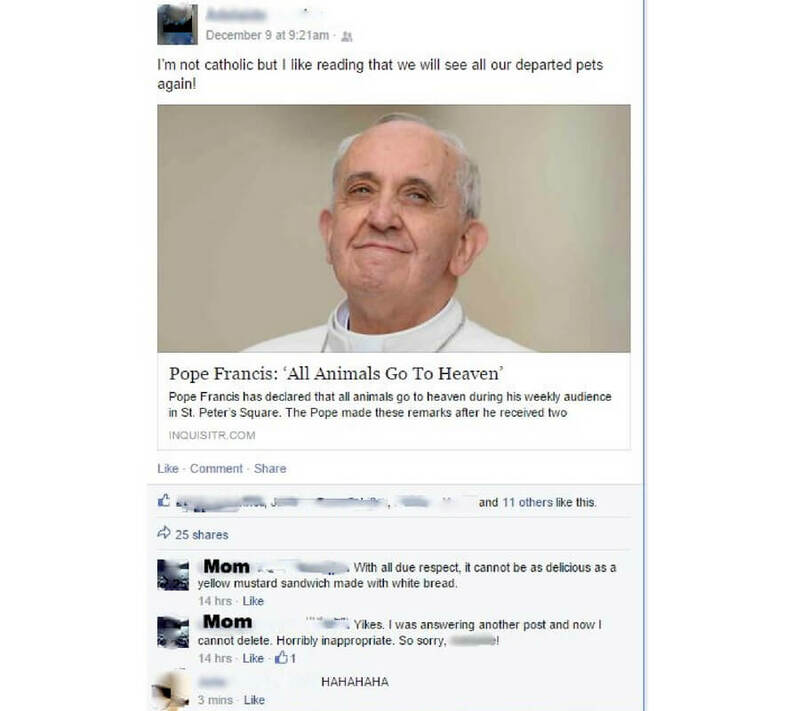 Well, it can happen on Facebook if you’re not careful. This mom accidentally proclaimed her love for sandwiches over pet lives, and it’s probably one of the funniest things you’ll ever see. Some people live with a mentality of “ask, and you shall receive.” This grandma is putting it out to the universe that she wants the Christmas pictures, and only time will tell if it works. There’s nothing wrong with this mentality, but I guess that she’s going to be waiting a long time for her pictures to upload if she hasn’t uploaded them. You’ve probably been mad, but have you been ‘post on Best Buy’s Facebook page and threaten them’ mad? Well, Rob isn’t about to get another post deleted. I feel like other steps can be taken before any severe threats get thrown around. An old man goes straight to the source to see if his favorite greeter is alive or dead. The hilarious screenshot is just ahead. Yes, puppies playing together is absolutely adorable. Yes, little kittens snuggling up to their mom is heartwarming. But, two little old ladies proclaiming their love for each other on Facebook probably takes the ‘cute cake’ award. 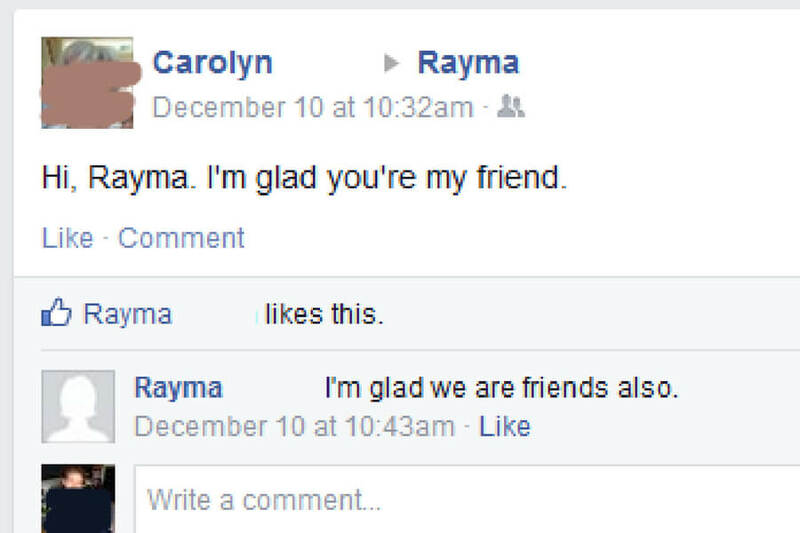 I hope Carolyn and Rayma get a ton more friends out of this post. It shouldn’t come as a surprise that grandparents have their brands and they stick to them. If you don’t think your grandpa will run his 1996 Honda Civic until it blows up, you’re wrong. 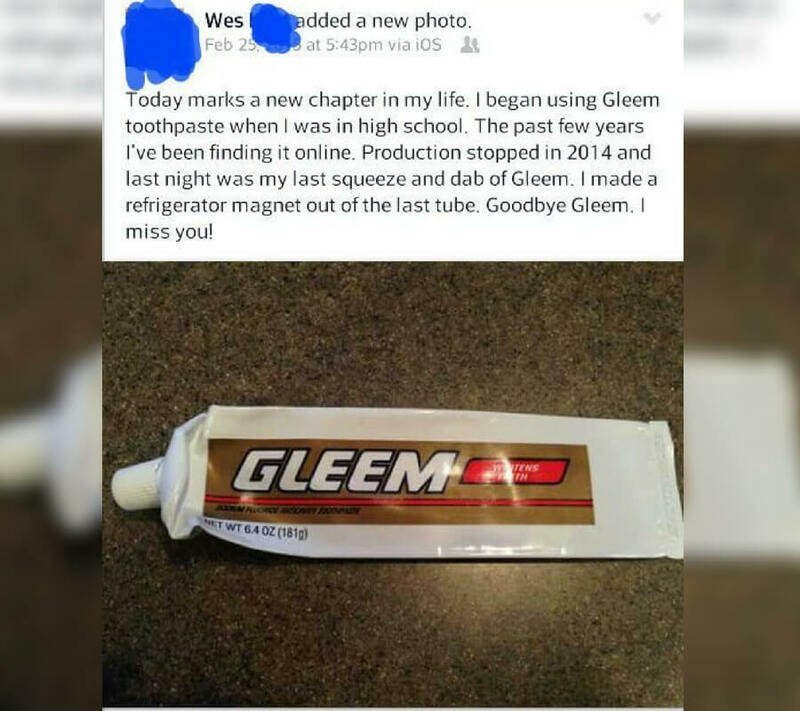 Change is difficult in general, but changing something like toothpaste that’s been a part of your life forever is even harder. One of the most underrated jobs when you walk into a Walmart is their greeters. Those people make everyone’s day a little brighter. 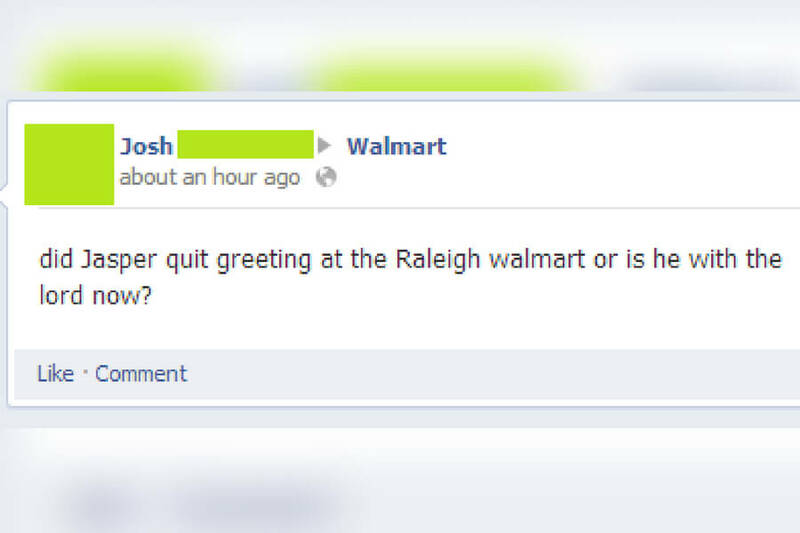 When you go to the same Walmart and see the same greeter for years, you establish a relationship. Josh probably hasn’t seen Jasper on his last three visits and needed to get to the bottom of it. 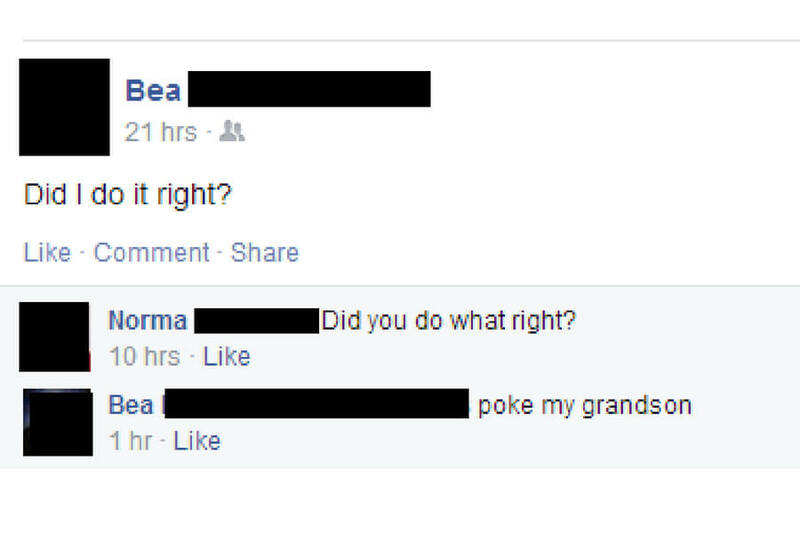 Coming up, a grandma makes sure that she pokes her grandson and it turns out bad. I don’t think that there’s anything more urgent than asking one of your friends if they can impeach the President of the United States. Yes, if someone broke into your house, that’s pretty urgent. Yes, if one of your family members needs emergency medical help, that’s urgent. But, this is perhaps the most urgent message that directly affects hundreds of millions of people. 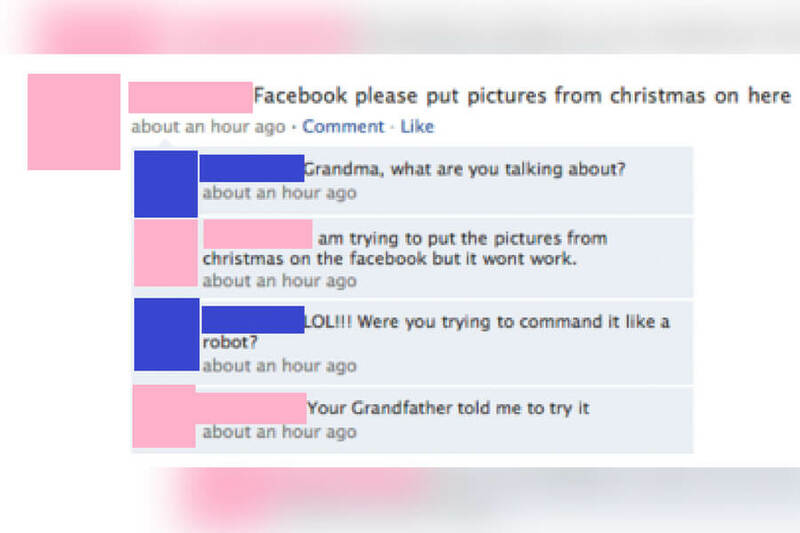 If you wanted your grandma to lie about your picture, it’s just not going to happen. She’s going to be on your team no matter what, even if that means bringing down your friends. Sorry, but not everyone can be as beautiful to your grandmother as you are to her. She’s just honest. Okay, can we just talk about how annoying it is when someone ‘pokes’ you on Facebook? What’s the point? It’s literally just an unnecessary notification that you get and no conversation actually comes from it. It started off pretty innocent, but then, as usual, we ruined it and made it creepy. Irrelevant, Irrelevant, Irrelevant. You can only feel bad for these people who feel like they have to write about their loved ones dying on a dollar store Facebook wall. I mean, to each their own, and maybe that’s how people can cope with their loss? It just seems very bizarre how common it seems to be. And, if my point didn’t make any sense before, it probably will now. 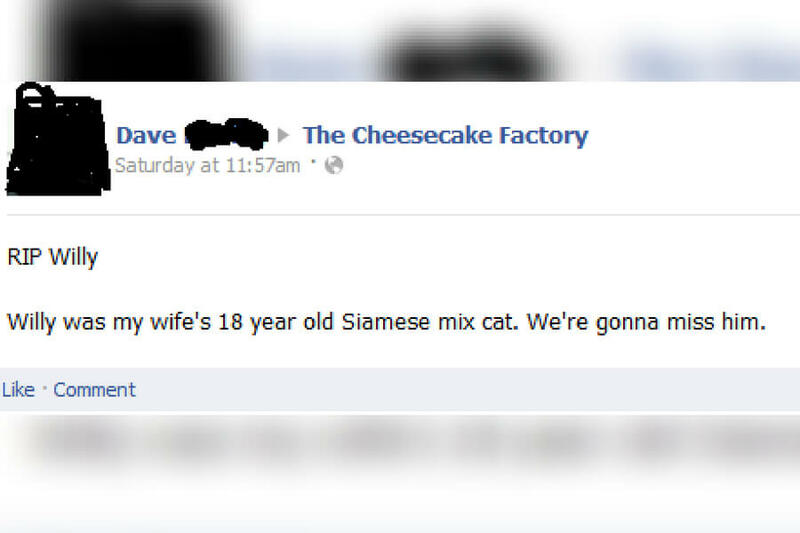 WHY does the Cheesecake Factory care about your cat dying, Dave? I guess it would be a plot twist if the cat was killed because it ended up eating some of the Cheesecake?